Indeed, much like with JFK, while veracity is a piece of the pecan pie, I know going into an Oliver Stone film that what I’m looking to get out of it is a coherent story that takes you from point A to point B. Stone does a good job displaying George W. Bush’s past — from his fraternity days at Yale, to alcoholism, to his born-again faith — the film as a whole doesn’t do a good job at guiding you along a path to understand the importance of this history. For starters, there’s scenes of 43 on a baseball diamond that, to me, make no sense. He was a co-owner of the Texas Rangers, and W. Bush mentions his passion for baseball several times, but the actual scenes make no sense. Are they dream sequences? Aspirational? Some kind of Freudian-psychology thing about Bush’s insecurities? And another of my big problems with W.? 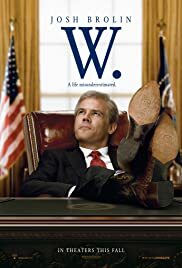 The way Josh Brolin portrayed George W. Bush. A lot of it seemed mostly half-assed as if Brolin knew how to do a good impersonation of him, but decided to not try that hard. He’s got half the southern-drawl, under-exaggerated facial expressions (like his smiles), but then he over-exaggerates everything else. Part of my reaction to the portrayal might be a damned-if-he-does/doesn’t reaction, but I think Brolin could’ve done a better job at either going full-on Bush, or not trying altogether and creating his own caricature. After recently finishing The Looming Tower on Hulu, I did enjoy W. for adding to my data set for this time-frame of history. Though this is the era in which I grew up (well, Bush’s Presidential years, not his college/Texas Governorship years), I have been watching and learning more as of late. Continuing my streak of ringing-endorsements of late, there are worse films than W. you could watch, so if it comes on you don’t need to immediately swtich away. But perhaps pick a different film to put on the television instead.